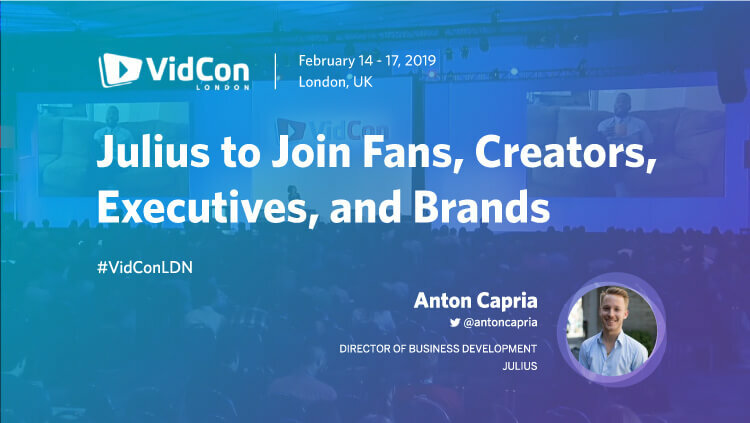 Julius’ Director of Business Development, Anton Capria, will be flying across the pond from New York this week to attend VidCon London 2019. Below is a glimpse into what he’s looking forward to at the event. As I did my homework to prepare for my first VidCon London, I quickly realized that my experience (I hope) won’t be like the many depictions I read about online. Since I will be following the industry track, I don’t imagine it’ll be a “boy-band concert on acid,” as one article described the better-known aspects of the conference. Instead, I expect it’ll be a great opportunity to learn strategies from leading individuals in the digital media/marketing world. VidCon itself describes the Industry Track as offering “unparalleled access to top industry leaders, creators, and experts. This year’s Industry Track will provide deep insights into how to build sustainable and profitable communities, best practices for using video to sell products and services, and in-depth strategy discussions that will chart the course for the future of online video and media in general. With lots of intriguing content spread across multiple days and a few business meetings of my own to juggle, I may have to make some tough decisions on which panels to attend. Two that I don’t want to miss feature two of the most important companies moving forward when it comes to influencers and video content – Facebook and Instagram. I’m looking forward to hearing Patrick Walker of Facebook and Ashley Yuki of Instagram share what is next for each platform respectively in their continued investment in creators and the video channels available to them. Additionally, two packed panels featuring executives from the media and music industries – Becoming a Social First Video Company In Today’s New Monetization Era and How the Music Industry Embraced Digital Video and Built a New Audience – should shed light on a changing landscape for their consumers. While those are some lofty goals to fit into four days, VidCon certainly does present a great opportunity to achieve what I look to get out of any conference – knowledge and business. With the ever-growing and changing digital and social industries, influencers and creators may be one aspect the market is just beginning to grasp the full potential of. VidCon at its core represents what’s coming next in online content creation. By bringing together viewer, creator, and business communities in one place, it should be an amazing opportunity to learn more about the influencer ecosystem I work in on a daily basis. The workshops, seminars, and panels the Industry Track promises are loaded with brand and agency executives as well as the influencers that will power a $5-10 billion market by 2020. The speakers and attendees also represent a target rich opportunity to meet, learn from, and hopefully do business with fellow influencer marketing professionals. Interested in meeting me there? Let’s meet up! You can find me on the VidCon app or reach out to me on LinkedIn – I’ll be wandering the conference all week!